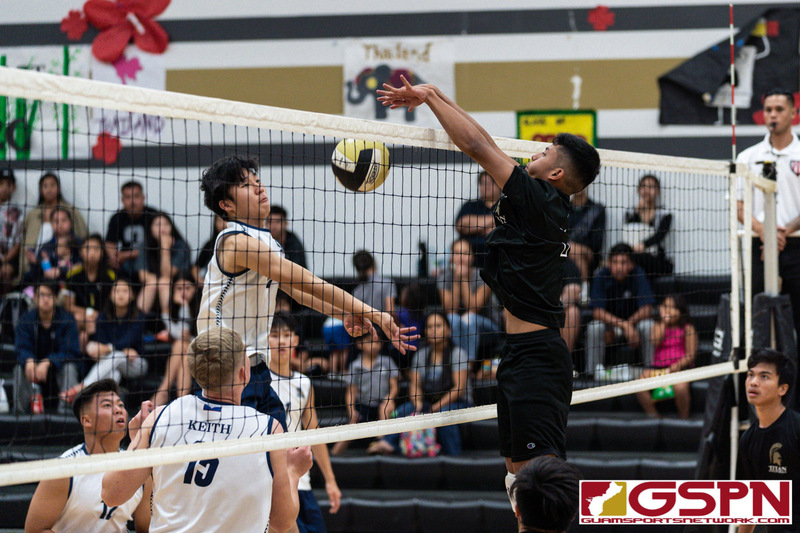 The Tiyan Titans climbed the IIAAG Boys Volleyball ranks after an impressive four set victory on their home floor against the Harvest Eagles (25-17, 22-25, 25-19, 25-22). The win was highlighted by an all-around performance from Tiyan outside hitter Neil Ericsson. The fourth and final set was highly competitive as both teams traded both points and momentum. Throughout the contest, Harvest had several instances where mental lapses got the best of them and Tiyan would capitalize on each of those moments down the stretch. There was a period in the fourth set where Harvest began to develop a rhythm and shrunk a 17-13 deficit to eventually tie the game. It was a kill by Harvest’s Mason Caldwell that would spark a run to tie the game at 18 apiece. Tiyan regrouped a few plays later and maintained composure, picking up back-to-back points after two long rallies. A kill by Tiyan’s Trever Martinez tied the game once more at 20, forcing Harvest to call a timeout. The home crowd began to ramp up the intensity from there on out and would contribute to the game’s final outcome. Tiyan Senior Neil Ericsson would come up big in the game’s final moments, converting on his team’s final three points off-of powerful kills. A brother to brother connection would be on display on the game winning play as Gary Ericsson setup Neil perfectly for a kill which would secure the victory as Tiyan won the fourth and final set 25-22. “I knew that my teammates were counting on me to come up big in those final moments and I didn’t want to let them down. We kept our composure and on the final play the pass was there, the set was great, and I was able to finish off the game,” said Ericsson. Tiyan won the first set 25-17 after a set-winning block by Jericho Snaer. The lone set that Harvest won came in the second and was highlighted by Harvest’s duo of Jacob Oshiro and Mason Caldwell. Oshiro finished the set with three kills and three blocks and Caldwell scored on five kills. Harvest got off to a great start at the beginning of the third set and went on a 4-0 run. But placement errors and miscommunications would prevent Harvest from maintaining a lead and Tiyan would capitalize and finish in the fourth set.